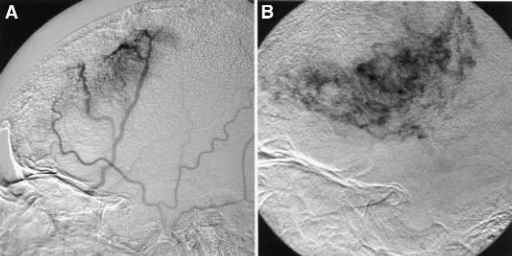 Endovascular treatment of benign and malignant intracranial tumors is focused on superselective intraarterial delivery of chemotherapeutic agents and pedicle embolization for tumor devascularization. Endovascular techniques are particularly valuable in the preoperative embolization of tumors that are highly vascular as well as those involving difficult surgical exposures, such as skull base neoplasms. Vascular metastatic lesions, such as renal cell carcinoma, are also routinely referred for preoperative embolization. In select cases of advanced stage medical illness or inoperable tumors, endovascular therapy may be used alone as a palliative option. The intraarterial delivery of chemotherapeutic agents to treat central nervous system disorders dates back to the 1940s when direct injection of drugs into the carotid artery was attempted for the treatment of syphilis. Several more contemporary studies have demonstrated that the uptake of antitumoral agents by neoplastic cells depends on many factors including pharmacologic properties of the agent, integrity of the blood-brain barrier, intravascular concentration of the agent, and the presence of arterial flow (27,28). Under appropriate conditions, tumor uptake is nearly 50 times higher when chemotherapeutic agents are administered intraarterially rather than intravenously (29). The local nature of brain tumors should theoretically permit local chemotherapy (30). 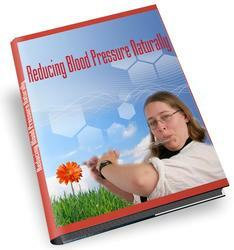 Previous intraarterial regimens used nitrosoureas, but these have generally been abandoned because the side effects outweighed the benefits of treatment (31-33). Shapiro et al. (32) reported a randomized study of intracarotid infusion of chemotherapy (1,3-bis(2-chloroethyl)-1-nitrosourea [BCNU]) for newly diagnosed malignant gliomas. 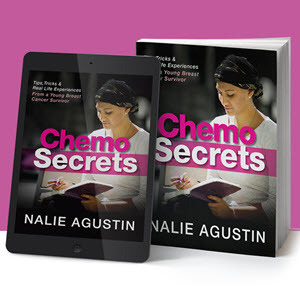 Their results showed a reduced rate of survival among patients receiving intraarterial chemotherapy, especially those with anaplastic astrocytoma. The presence of BCNU-induced necrosis on white matter and the ocular toxicity of the drug explained these results. Other agents such as cisplatin have also been tried, but their neurological and retinal toxicity limits the dosage that can be safely administered locally (34,35). Qureshi et al. (36) reported their experience with intraarterial infusions in a series of patients with intracranial neoplasms that had demonstrated a poor response to radiation, intravenous chemotherapy, and/or surgical removal. In some treatment sessions, RMP-7, a bradykinin analog, was infused concomitantly with carboplatin in an attempt to manipulate blood-brain barrier permeability and increase the transport of chemotherapeutic agents into the tumor. Owing to the retrospective characteristic of the study and the variety of tumors treated, these authors could only conclude that intraarterial administration of carboplatin with or without RMP-7 appeared to be safe and feasible. Although it is an appealing approach, local intraarterial delivery has not yet contributed to any significant improvement in the length of survival of patients with central nervous system diseases (37). Further investigation is necessary to evaluate the long-term survival and effects of intraarterial administration of carboplatin and other chemotherapeutic drugs. Preoperative occlusion of vascular pedicles is feasible for certain types of tumors including extraaxial and primary bone tumors and for some intraaxial tumors as well (38,39) (Table 3). The goal of embolization with these neoplastic disorders is to devascularize the tumor capillary bed while preserving the normal arterial circulation. Before the injection of any embolic material, the interventionist should carefully reexamine the anatomy and hemodynamics of the vessel to be embolized, with special attention paid to possible dangerous anastomoses, caliber and pattern of tumor vessels, blood flow characteristics, and circulation to adjacent territories (39). Preoperative assessment of the tumor is of particular importance in planning the embolization and assessing the risk that may apply to a certain tumor. In particular, anatomic localization will determine the vascular supply that will provide access for embolization. The neuroendovascular surgeon must be thoroughly familiar with the blood supply to the skull base and meninges to obtain adequate angiographic images of the tumor. Preoperative assessment must also include a detailed examination of the neurological territory adjacent to the tumor and the vascular territory at risk during the embolization (40). Primary Bone Tumors Aneurysmal bone cyst Hemangioma Chordoma Chondrosarcoma Osteogenic sarcoma tionships to bony landmarks, such as the petrous apex and basal foramina, are critical aspects of any evaluation. The relationship of the tumor to major vascular structures, such as the petrous or cavernous carotid artery, will suggest whether vessel sacrifice is an option. If it is a possibility, a balloon test occlusion should be performed to determine the patient's tolerance to such a procedure. In cases of failure to pass the balloon test occlusion, a major revascularization procedure (bypass) should be considered before definitive vessel occlusion. Superselective angiography often demonstrates a vascular blush that was inapparent on routine angiography. Of particular interest are dangerous anastomoses that may exist between vascular territories (Table 2). Angiographic visualization must not be relied on exclusively, however; provocative testing with lidocaine can be used to demonstrate risk to the cranial nerve blood supply. Additional provocative testing with methohexital or amobarbital may demonstrate the presence of parenchymal anastomoses. Fig. 3. Contrast-enhanced magnetic resonance images, axial T2-weighted (A) and coronal Tl-weighted (B), demonstrate a right frontal lesion, with diffuse contrast enhancement exerting a mass effect on the right frontal lobe and right lateral ventricle. These findings are suggestive of a meningioma. Several flow void signals are observed on the T2 image (arrow), denoting intense neovascu-larization of the lesion. Fig. 4. Selective right external carotid artery (A) and selective right internal carotid artery (B) lateral projection angiograms demonstrate tumoral blush. concern regarding its use. Reflux of absolute ethanol should be assiduously avoided. Each embolic agent has advantages and disadvantages. The discussion of the suitability of each agent for a particular situation is beyond the scope of this chapter. Fig. 5. Lateral projection angiogram of the right external carotid artery demonstrates obliteration of the tumors feeders after selective Gelfoam powder injection. The tumors most commonly embolized are meningiomas (see Case Illustration section next). These benign tumors can be extremely vascular and may be associated with extensive blood loss during surgery. Although radical surgical removal remains the gold standard of treatment for meningiomas, the endovas-cular occlusion of nourishing vessels facilitates and shortens the length of the surgical procedure. Jungreis (41) described a significant reduction in intraoperative blood loss after endovascular pedicle occlusion. Direct percutaneous puncture with intratumoral injection of embolic agent may be another effective treatment for selected vascular tumors. Casasco et al. (42,43) used direct puncture of vascular intracranial and head and neck tumors with intratumoral injection of NBCA. 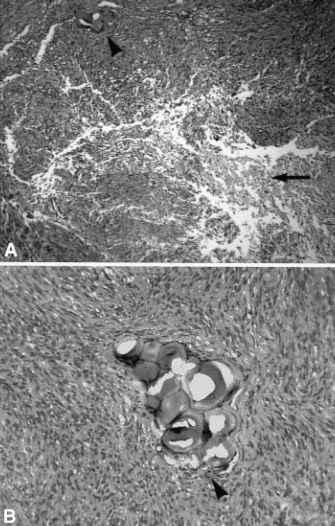 Complete angiographic filling of the tumor volume was achieved with regression of the tumors in 80% of cases. Some controversy remains concerning the ideal timing for surgery after tumor embolization. 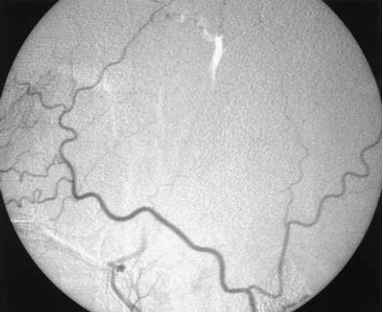 Embolization is usually accomplished in one session. Intervals of 1 d to several weeks have been suggested; however, the optimum interval still needs to be determined (39,44,45). In the authors' experience, delays of more than 6-12 wk are associated with tumor revascularization (39). Surgical resection 1-4 wk after embolization is recommended to allow for maximal devascularization, as well as minimal cerebral edema and tumor swelling. Fig. 6. Photomicrographs of the tumor (A, H&E x60; B, H&E x120) demonstrate a hypercellular lesion with densely packed cells and areas of necrosis (arrow in A), compatible with an atypical meningioma. Note the presence of embolic material inside some of the vessels (arrowheads). toparietal craniotomy, with gross total tumoral resection. The histological diagnosis was compatible with an atypical meningioma with areas of necrosis related to embolic material (Fig. 6A,B) and evidence of Gelfoam inside the vessels.